It was either up at 0400 (no thanks) or some time approaching midday as the harbour flooded before we could leave. We were itching to go and the harbour master reckoned it would be around 1230 before the channel could take our draft. Bob inched us out at around 1220 reading pretty much zero the whole time and just touching the sand at times. We set full sails for a beat across to the West Pole marker outside Chichester harbour but decided after 90 minutes to furl away the headsail and motor over there. We wanted more time in the harbour, possibly paying a visit up towards Bosham, so we figured it was worth the trade. 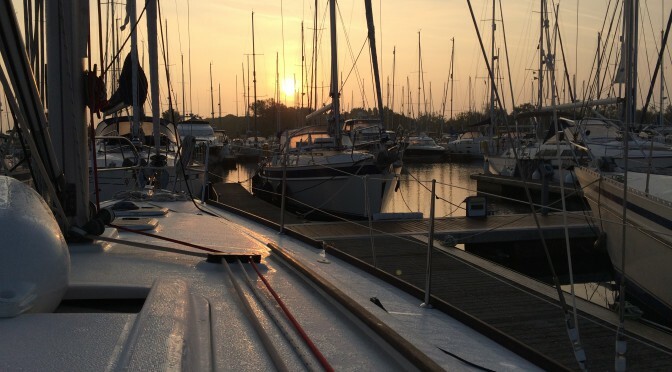 Mark had prepared a pilotage plan into the harbour and around to the marina and as we rounded The Winner unfurled the headsail and put the engine into neutral on a lovely beam reach. The approach up the Chichester Channel follows an old Roman transit – using a white mark on the shore about a mile away together with a smaller white post in front of it or a large clump of trees distant in the hills. We could see traffic building up as we came up to Cobnor Point but there was plenty of wind and it was a case of bearing away if necessary. The slight of several dozen, score even, of children racing on a Saturday afternoon was fabulous – really encouraging for the sport. But it also makes for concentration as they were crossing in a seemingly continuous line across our path. We bore away towards the shallow water and nipped behind the last dingy into a gap before the next tranche. We were on port tack and close reaching with plenty of room for bearing away or hardening up as necessary. The three of us were concentrating 100%, communicating clearly & calmly, working as a team should – very very satisfying. The excitement of passing the dinghies over, we continued our beat into Itchenor Reach passing the slipway and visitors pontoon. We were tacking between the two lines of moored craft some 150 metres apart. Behind us a Southerly 42 was sailing also, the helm clearly enjoying himself. His crew was reading a book not having to take part since the self tacking jib was doing all the work for her. I sailed one a couple of years ago and they are lovely, but there’s something missing when the boat does all the work. It was also quite difficult (we never figured out how) to set the jib so it didn’t need fine tuning on each tack. He was going a lot quicker than we were and I asked him if he was using his engines. He said no but that he was overtaking anyway which I understood and explained that I was trying to figure out how to let him past easily. After a couple of aborted attempts when we left our tacks as late as we dared (but not late enough so he could slip past), he finally did. 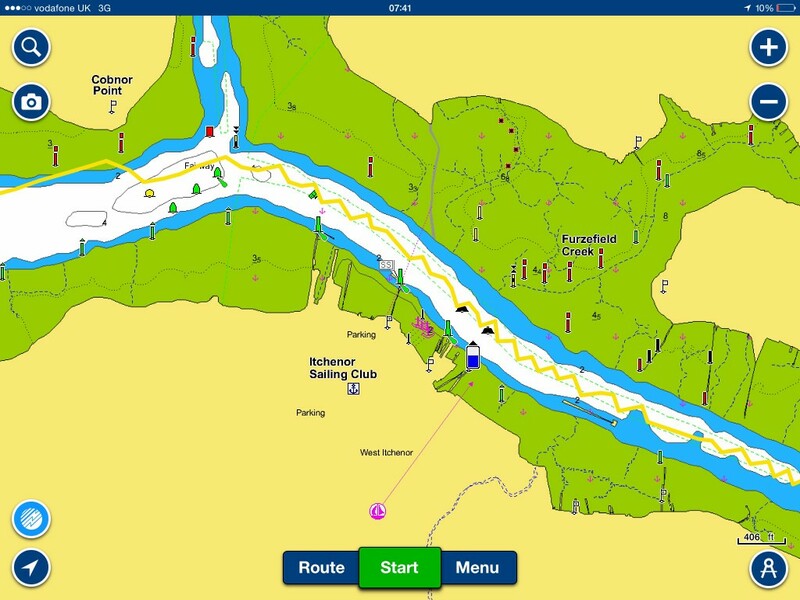 We tacked 63 times in 45 minutes (I later checked the track on the Navionics) – so that’s once every 43 seconds – during the 1.5 miles along Itchenor Reach. Absolutely brilliant. Several people sitting in their moored craft, waiting nervously I would think, commented how had they watched us and were impressed with what we’d achieved. By and large the overtaking vessels followed the rules – one exception being a motor cruiser who sounded two short blasts (I’m turning to port) as he passed us on the port edge of the channel just as we needed to tack back across. He should have sounded “two long, two short” would be “I’d like to overtake your port side” and then waited for our reply “yes or no”. We shouted ‘what are you playing at’ and the lady simply shouted back “Sound signals” – go figure.